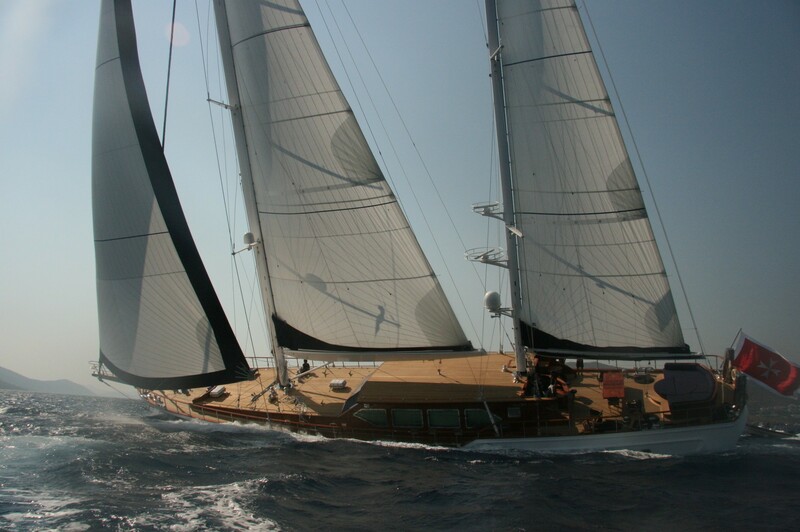 Sailing yacht CLEAR EYES was built in 2010 by Paxnavi shipyard of Turkey and measures 43m (141.1ft) in length. 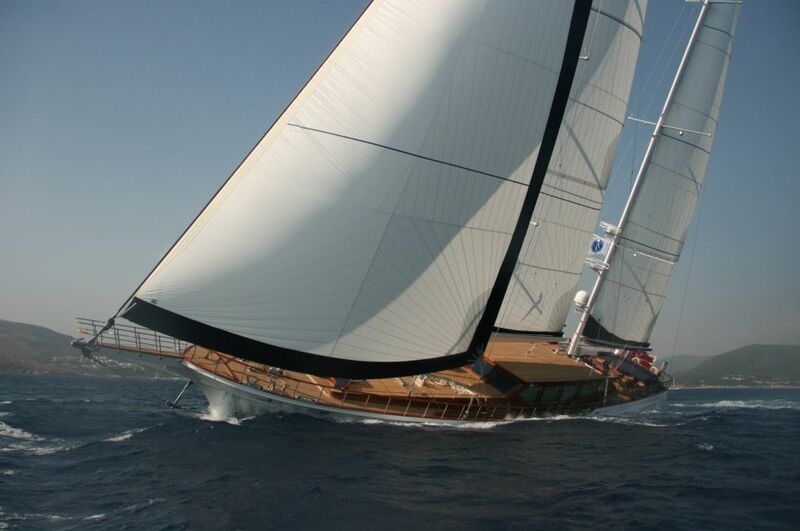 S/Y CLEAR EYES features a steel hull, capacious exterior living, and generous trendy interiors. 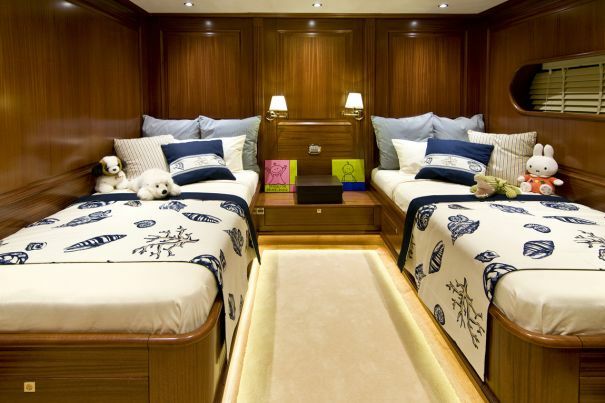 The yacht offers accommodation in 5 en-suite cabins, for up to 10 charter guests. 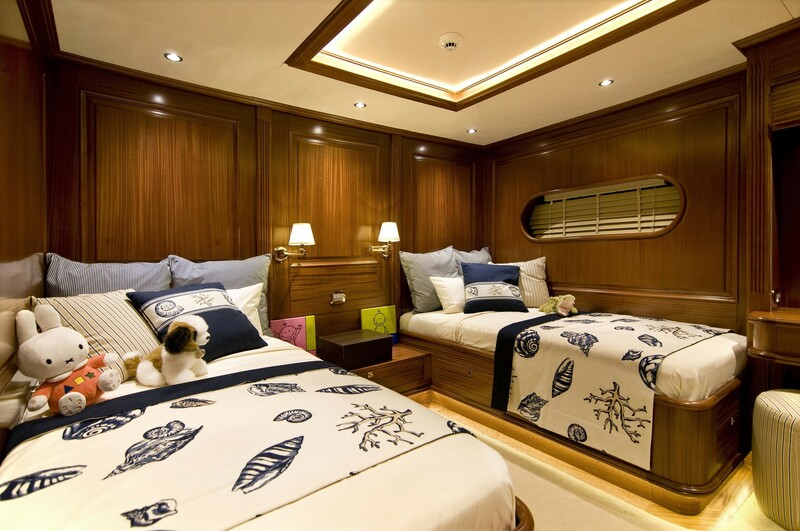 The CLEAR EYES sailing yacht features a bespoke interior décor of warm wood panels, neutral carpeting and stylish pastel soft furnishings. The salon and dining is raised position and open plan, offering a comfortable lounge formal dining table and state of the art entertainment. Surrounding panoramic windows infuse the area with ample natural light. 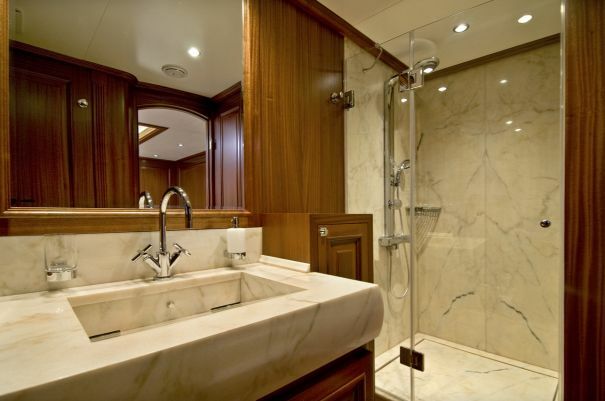 Below decks fore and aft of the salon are 5 guest cabins, all with private en-suite facilities and entertainment systems. The crew has separate quarters forward. Charter yacht CLEAR EYES is fully air conditioned for optimum comfort. Crewed sailing yacht CLEAR EYES has plenty of exterior living areas to relax on her fine teak decks. The aft deck is ideal for entertaining, boasting an alfresco dining option, wet bar with stool seats, full beam aft sunpad and deluxe Jacuzzi tub. 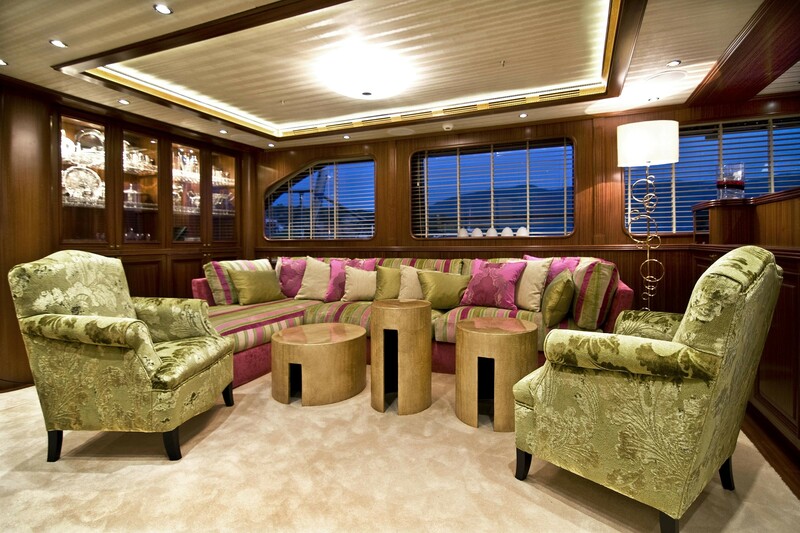 Wrap around 360° deck lead to a spacious foredeck and 2 built in seating areas, ideal for a quite escape. For the sun lovers, the cabin house is perfect for sunning and enjoying the incredible scenery under sail, or at anchor. 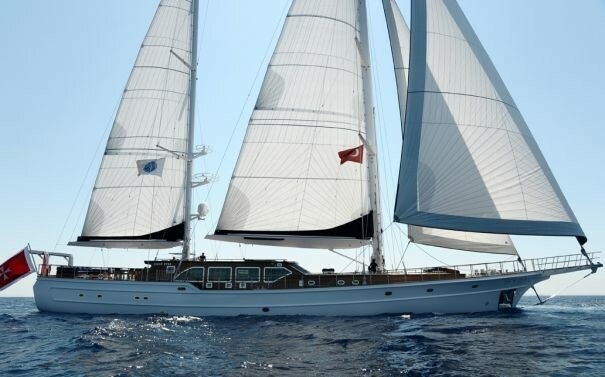 Gulet CLEAR EYES is powered by 2 x CAT 670hp engines and is capable of 10 – 13 knots. 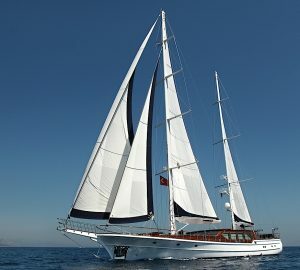 Crewed yacht CLEAR EYES offers accommodation for 10 yacht charter guests in 5 well-appointed and generous cabins. 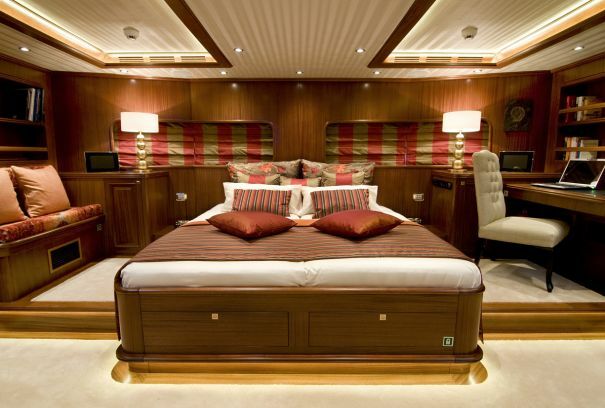 The master stateroom is aft and full beam of the yacht, with a center lined king size bed, seating area and vanity/desk. 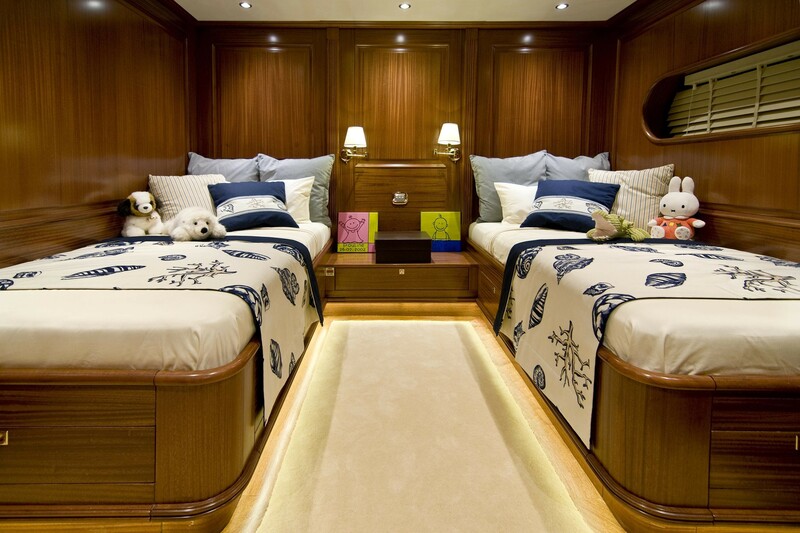 Forward of the master cabin and aft of the salon, are 2 mirror image twin cabins, each with side by side single beds. Forward of the salon are 2 guest cabins, with walk around queen size beds, this cabin boasts a central partition that can be opened to provide a large full beam master cabin, complete with 2 en-suite facilities. All 5 cabins aboard the S/Y CLEAR EYES feature state of the art entertainment systems and private en-suite facilities. 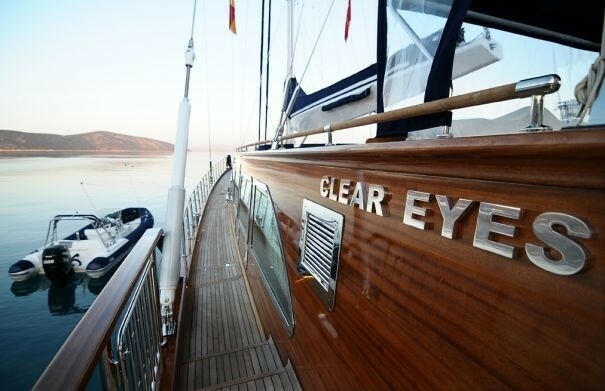 The CLEAR EYES yacht has the following Tenders & Toys: Tender 6.4m Northstar with 225hp Mercury (at the aft end of the yacht, on a davit), - Tender 3.5m AB with 20hp outboard, - Tender 2m Quicksilver with 6hp outboard, - Jetski Seadoo RXP 250hp, 2 seater, - Sea Bob 5hp (diving up to 40 meters), - Laser Dinghy Pico Plus, - Selection of Water ski, wake board, Knee board, Trampoline, inflatable Kayaks and snorkeling gear - Spa Pool, Communications - Internet - Wire & Wireless Network: Netgear Cisco, HP, 10 terrabyte memory Audio Visual Equipment and Deck Facilities All cabins are equipped with state-of-the-art TV, entertainment, communication and internet equipment. GSM Wireless is the standard and guests are welcome to bring their I-Pod. Guests can choose films from the huge server library of the yacht – all can enjoy watching their dia shows of the photographs taken during the day or just follow the route of the ship. The TV of the main saloon allows operating the mast camera to check out beaches miles away. 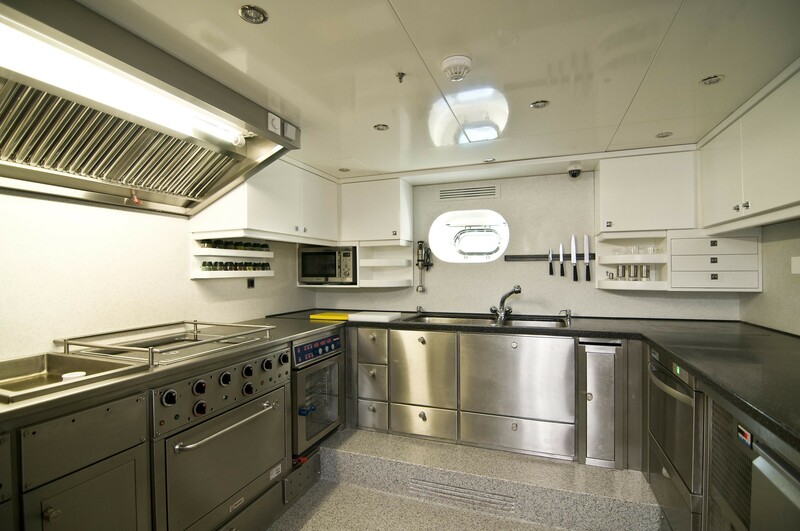 Clear Eyes provides three deck areas: the aft deck provides a huge lay-down area with an integrated whirlpool and the area is organized to be serviced from all sides. 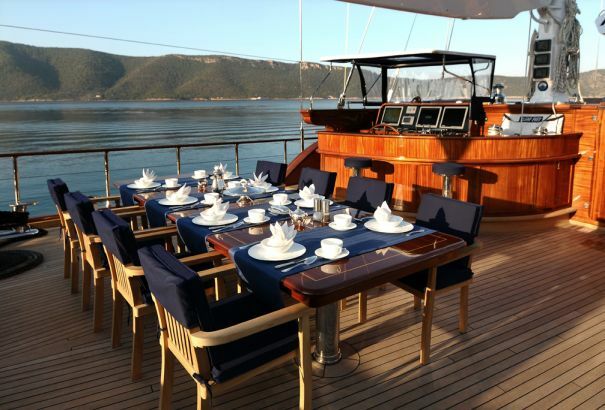 The al fresco dining arrangement allows comfortable seating for all guests; the dining table consists of three pieces which allow for an easy configuration of two separate tables for better use during sailing. 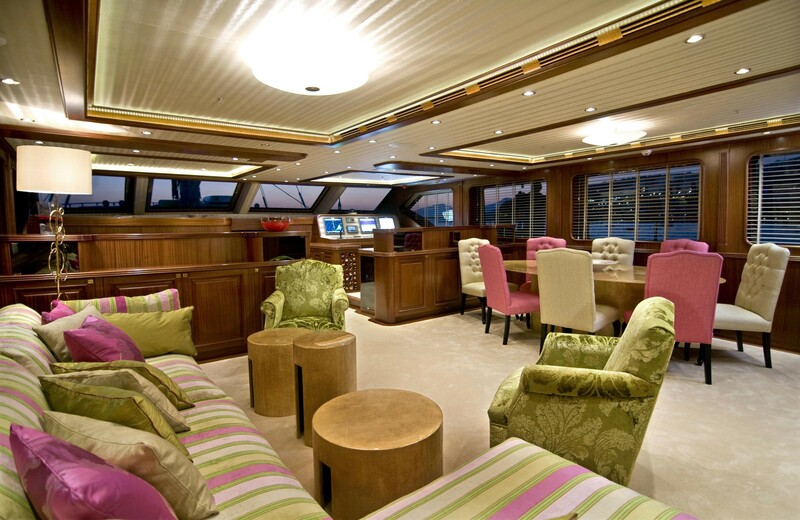 The fly bridge and helm station of the Captain are surrounded by a bar arrangement, where drinks can be enjoyed while watching the Captain sail. 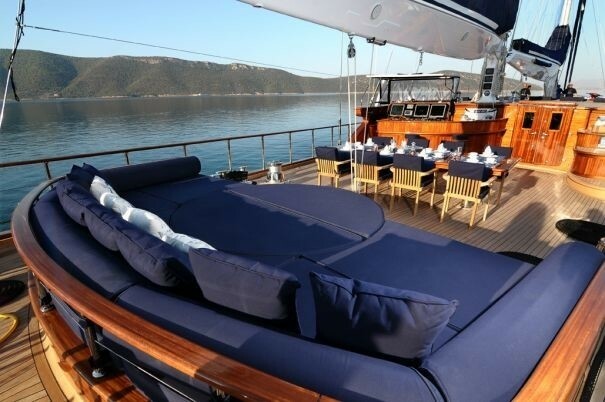 All three areas of the aft deck are protected by a sun tent which can easily be secured for sailing. 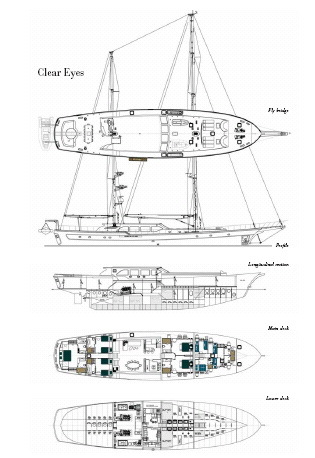 The sleek design lines of Clear Eyes allow a full visibility from the aft deck over the main deck. 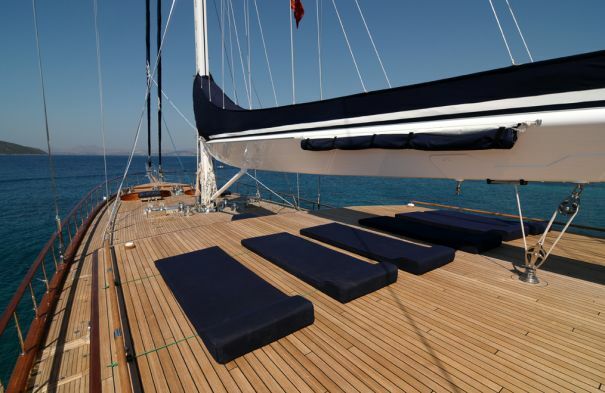 This deck provides a huge sunbathing area and can also be partly protected through a tent arrangement fixed to the main boom. The front deck carries Clear Eyes' toys and tenders, whereas the top front part provides two intimate seating arrangements where guests can enjoy the elements of wind and water, or a beautiful sunset. All deck equipment like gangway, davits, bathing ladder, cranes and captive winches are completely integrated in the superstructure cladded with mahogany and teak.